The craft of hand-forming sheet metal is fast becoming a lost art. Author Eddie Paul is a master at sheet metal fabrication and in this book shares with readers the techniques to shape their own sheet metal creations. Sheet Metal Fabrication: Techniques and Tips for Beginners and Pros covers the necessary tools and how to use them; how to choose, prepare, and work with the most suitable material; how to make bucks, plugs, and mock-ups; and how to cut, bend, form, and join sheet metal. 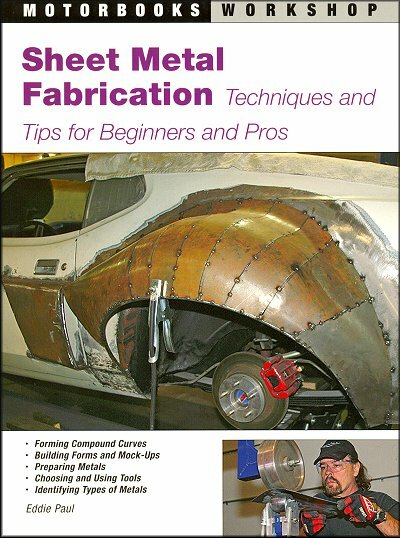 Whether you want to shape a fender for a custom car, re-create damaged panels, or just learn about this intriguing process, Sheet Metal Fabrication is a thorough reference book and guide, and a uniquely valuable resource every do-it-yourselfer needs. Beginning as a self-taught welder, painter, metal fabricator, and machinist, Eddie Paul has gone from customizer to creator, designer to inventor. His company, which performs an array of engineering design, and manufacturing services, has served clients as diverse as the Dept. of Defense, Boeing, and Rockwell. He lives in El Segundo, California. Ask a question about Sheet Metal Fabrication: Techniques and Tips for Beginners and Pros.